The National Aquarium is less than one hour from Washington, DC and is very accessible as a day trip if a vacation to the nation’s capital is the destination for your vacation plans. Newly renovated, the aquarium holds 17,000 animals. The dolphins, sharks, and a rescued 500-pound green sea turtle named Calypso make up just a few of the favorites who reside there. For reduced ticket fares and short entrance lines, make an easy stop at nearby Fort Meade’s MWR. Adult tickets are $31.00 and $21.00 for children. MWR is not open on Saturday or Sunday. Avoid the long lines and buy tickets from The National Aquarium's website to be picked up at will call. Fridays After Five is the reduced price program for evening hours between 5 - 9:30 p.m.
4-D Immersion films are free for active duty military. Arrive at day’s opening to see the aquarium with the least amount of visitors. Strollers are not permitted. They may be stored, and back/front pack kid carriers are available. Head to the dolphin presentation at 10:30 a.m. and 1:15 p.m. The morning viewing is less crowded and full of information and dolphin play. 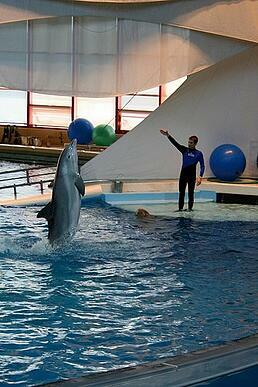 The afternoon talk features the trainers feeding and interacting with the eight bottlenose dolphins. There isn’t an official dolphin show anymore, but educational talks are offered periodically throughout the day in the pool area. The Inner Harbor area is adjacent to the aquarium and provides food, shopping, and other activities and tours. Make a weekend trip and hit a baseball game at historic Camden Yards, which is an easy walk from the aquarium. Get a hand stamp for reentry and dine on kid friendly fare at the new Chick-fil-A and Shake Shack. Only steps away, the Hard Rock Café offers a kid-friendly menu and with purchase of $25.00 or more, a free souvenir. Recharge with a coffee break next door at Barnes & Noble. Amtrak Rail: Penn Station: 1500 N. Charles Street is just over a mile from the aquarium. Taxi and Charm City Circulator service is available. Charm City Circulator: Free with convenient aquarium stop on the Orange Line. Parking is expensive and difficult to find, other than parking garages. Use hotel stays to park and walk. Reduced fees by $4.00 or $5.00 at Lockwood Place Garage (124 Market Place, Baltimore, MD 21202) with validated ticket from aquarium’s information desk. There many national hotel chains within walking distance of the aquarium to include Hilton, Marriott, Hyatt, and Four Seasons. View each hotel’s website for aquarium specific deals, for example: Reserve the National Aquarium package at the Hotel Monaco and receive two tickets to the Aquarium (additional discounted tickets are also available), a deluxe guest room for two adults (and children stay FREE), continental breakfast for up to four guests and a 10 percent discount on lunch or dinner at the B&O American Brasserie restaurant. Make the most of your family’s spring break and summer travel by using military discounts where they apply! PCS-Lodging provides helpful relocation information with searchable hotel inventories near your destination.